There are many different types of roofing materials to choose from if you’re looking to install a new roof or replace an old one. You’ll quickly realize almost every roofing type has its share of pros and cons. For example, even if a roofing material is gorgeous and extremely durable, odds are it will also be expensive. However, one type of roofing material you may not have considered is rubber. 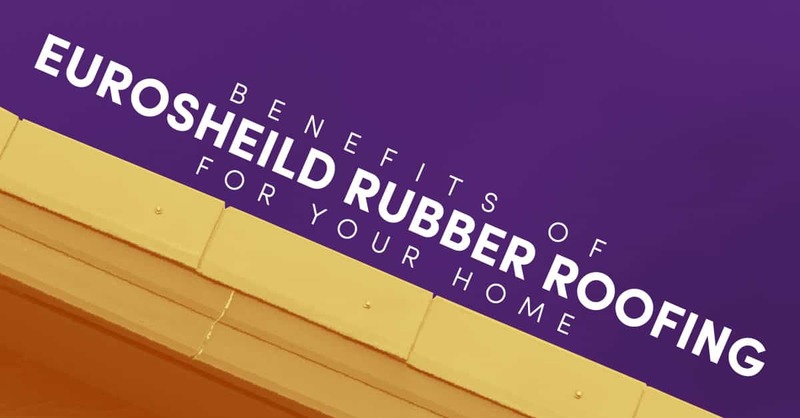 Euroshield rubber roofing may actually be one of your best options due to the numerous amount of benefits it will provide for your Calgary, Alberta home. The following are seven benefits of a rubber roof. The idea of having a rubber roof might perplex some people, especially when imagining how it might look. However, EuroShield rubber roofing actually mimics traditional slate and shake roofing tiles, giving it a traditional and classic look to fit with a wide range of home styles. EuroShield rubber roofing is also available in many different colors. Rubber roofing from EuroShield will, therefore, help to improve the overall curb appeal of your property. EuroShield’s rubber roofing material is made out of recycled material, which means you’re contributing to an environmentally-friendly product. One rubber roof produced for an average-sized home is made from roughly 250 to 1,000 used rubber tires. All of the scrap produced during the installation process is recycled again. Once the roof is replaced at the end of its long lifespan, the rubber roofing can be recycled again. Additionally, the way EuroShield rubber panels are designed will help insulate your home more effectively, thereby reducing energy use in warmer climates. Rubber roofing tends to be a much more affordable option than other roofing materials. This is due to how easy it is to obtain the materials needed for production. It’s also because it’s much easier to install a rubber roof than other roofing material, which means you won’t have to pay as much for the labor involved. Rubber roofing is less likely to experience damage than other roofing materials. First of all, rubber roofing is completely waterproof, which means you won’t have to worry about things like rot. It’s also resistant to thermal shock and won’t be affected by high heat or extreme cold. Other shingles may crack or become brittle as a result of such temperatures. Additionally, rubber roofing is resistant against hail and fire, which means it won’t get damaged very easily. This kind of durability means your rubber roof will last a long time and will require very little maintenance or repair work when compared to more traditional roofing materials, such as wood or asphalt shingles. Rubber roofing is one of the easiest types of roof materials to install. This is in part because of how lightweight it is. Heavy roofing materials may require the material to be lifted up to the roof one portion at a time to avoid having the weight damage the roof itself. This can be very time consuming, which factors into the expense of the installation. Rubber roofing can also be placed onto existing roofs. This means the old shingles won’t have to be removed — which can cut down on the cost of installation. Because rubber roofing is so easy to install, it’s also quite easy to replace in the rare event it is damaged. Because rubber roofing is fire-resistant, it can greatly improve the safety of your home. This is especially true if the roof is struck by lightning. Not only is it incredibly difficult to catch rubber on fire, but if a fire does break out inside your home or nearby your home, having a rubber roof can slow the spread of the fire, giving you more time to evacuate the house as well as to potentially save it. You’ll certainly get a high ROI (return on investment) when investing in a rubber roof when considering all of the benefits. Not only is it not a costly material, but it’s incredibly durable, energy-efficient, environmentally friendly, aesthetically pleasing, easy to install, and safe. These factors will all contribute help to improve the value of your home. If you’re looking for new roofing material you’ll want to find an affordable option which will last a long time and will maintain or improve your property’s curb appeal. As such, you can’t go wrong with EuroShield rubber roofing. For information about EuroShield rubber roofing, be sure to contact us at Hubbard Roofing & Exteriors in Calgary, Alberta to request a free estimate today. Read More: What Is A Euroshield Rubber Roofing System?